Looking over this week’s list of new books, I realize it should be a pretty small (read: inexpensive) week for me. Notice the word, should. And it would be a small, inexpensive week, for sure. If. Or, should I say, if not for. You see, my LCS has been shorted comics and books and things from Diamond for the past several weeks, and I have a funny feeling all of that back stock is going to show up today. Included in that mess will be a couple of hardcovers that I ordered and the Overstreet Price Guide. Which won't be cheap. Not even a little bit. Call it a hunch, but I’m willing to put (more) of my money on it being a big, expensive week of comics buying. Usually, that’s not the worst thing in the world. It simply means that there’s just a whole bunch of good stuff coming out, and that I’ll be working on making a nice reading pile for the weekend. But I’m talking, like, two months’ worth of stuff. All coming at me in a few hours. My poor wallet. And that’s what I’d like to talk about briefly this week before we get into the books. Like most comics fans, I tend to budget out each week before I get to the store. And I know pretty much exactly how much I’ll end up spending. Typically, if it’s a smaller week, I’ll budget a little extra to buy that trade paperback I’ve been eyeing, or whatever. Lately, though, because each week I go to the store expecting to spend a whole lot on back items, I’ve passed up some things that I normally would not have. So here’s the problem. A comics shop orders product three months in advance of said product shipping to them. Customers can request special orders from their retailer of choice with the same amount of lead-time. Not a perfect system, to be sure, but it’s what we’ve got. Just to backtrack here, and to drive the point home--It’s September when you’re ordering product for December/January, and at the same time, you’re getting product you ordered back in May. So, sometimes, losing track of purchases can happen. But, because Diamond’s Previews catalog has ship dates, you can certainly plan ahead. Right? Well, sure, if those ship dates actually meant something. In comics, more than in any other entertainment field, release dates mean nothing. If a director misses a release date for a movie? Fired. Never to work again. If a comics creator/publisher misses a release date? There’s a good chance that book will win an Eisner. It's just the way of things. In my job, if I miss a deadline? Yeah, not very many happy talks ahead for Alex. But in comics, not only is lateness accepted--it's celebrated. The same creators are constantly late. The word, constantly, is important in that sentence. Constantly implies that they have consistent work. Even though they're always late. We forgive them, publishers forgive them, and missing (promised) street dates is so common in comics that we jump up and down when a book isn't late. That's just plain messed up. And with that pile of wonderful, let's get to the books that are actually going to be in stores today. First up, from Dark Horse,a book that's part of the publisher's "1 for $1" promotion, where reprints of number one issues are released for the low, low price of a buck. 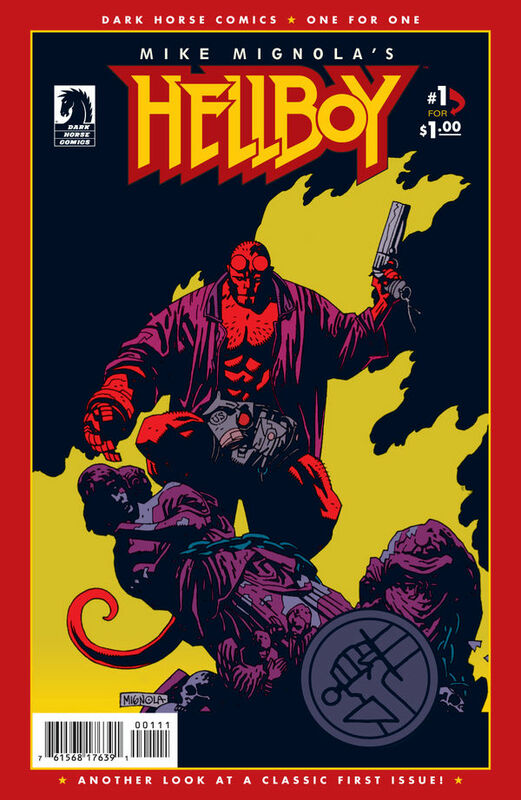 Today, Dark Horse ships Hellboy: Seed of Destruction, issue one, for a dollar. This is the book where it all started--the first true Hellboy story. The first movie was heavily based on this first mini-series, and while creator Mike Mignola doesn't draw this series (it's drawn by comics legend John Byrne), Mignola does the writing and he lays the foundations for decades of Hellboy stories. Hellboy bursts onto the film noir monster detective scene. From his apocalyptic origin in World War II England to the modern day case of the sole survivor of a doomed Arctic expedition, Hellboy must battle vampire frog creatures and worse in his debut miniseries. If you've ever thought about jumping onto the Hellboy family of books, I can't really think of a better opportunity to give it a try. I think it's a pretty awesome idea on the part of Dark Horse--practically giving some of their very best books away--and I hope new readers take advantage. 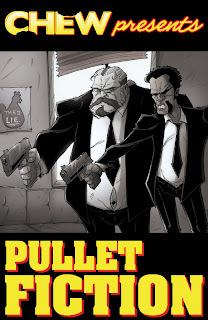 Next up, we have an image Comics title that has been a runaway success for the publisher, and for the creative team. Chew, issues 13, ships today, and it promises all the wacky fun of the first 12 issues. Tony Chu is a detective with a secret. A weird secret. Tony Chu is cibopathic, which means he gets psychic impressions from whatever he eats. It also means he's a hell of a detective - as long as he doesn't mind nibbling on the corpse of a murder victim to figure out whodunit and why. He's been brought on by the Special Crimes Division of the FDA, the most powerful law enforcement agency on the planet, to investigate their strangest, sickest and most bizarre cases. This book was the surprise hit of 2009, going through several sell-outs of the early issues, and demanding several printings of the trades. It's a weird series, written in a sometimes non-linear fashion by John Layman, and with incredible, quirky line art by artist Rob Guillory. "JUST DESSERTS," Part Three: Unlucky Number Thirteen! In which we see the return of rogue Cibopath Mason Savoy, a double agent is revealed and a narrative dirty trick is played upon an unsuspecting readership. Plus: What’s the deal with all those fricken chogs?? With that, I also want to mention that, last week, the Chew: Omnivore Edition hardcover shipped, and that book collects the first two story arcs of the series in an oversized, extras-laden package. It's not cheap--right around $35, retail--but it's certainly worth it. Chew is a great series, and while it's considered a huge indy hit, the truth is there are probably only 10,000 or so people reading the series. Let's up that number--go buy Chew! And with that, I'm out. Enjoy your comic book Wednesday, everyone, and before I go--what are you Waiting for? Wolverine Weapon X 16 is one of the best Wolverine stories I've read in a while.